Our glass coasters measure 3.75x3.75 and have clear acrylic feet. There are four coasters per set. Each set comes attractively bundled with copper wire and decorative beads. Makes a great hostess or other gift. Reminiscent of the Carribean Seas, our blue geo coaster adds a refreshing spark to any decor. Rainbow combines a playful selection of colors perfect for parties and patios. Each Rainbow coaster in your stack of four is exactly the same. Center comes in aqua (shown) or light green. The same layout as our Blue Geo. The Orange Geo offer a bright, sunny set of coasters for your summer gatherings or when you want to remember those warm summer days. Set also available with orange centers and red squares at the edge in place of the orange. Our mosaic coasters are created with the same colors in the same position for a matching set of coasters. Please note that the color positions from one set of coasters to the next will vary. 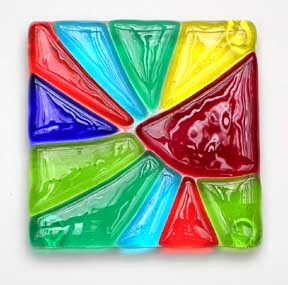 All mosaic coasters are made with the same mix of seven rainbow colors. Like our sea glass vases, these coasters are made from shards of recycled hand blown glass. Because the source glass varies widely, available colors may be limited or not always in stock. 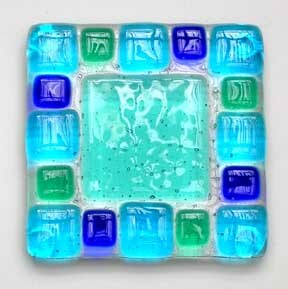 A set of four coasters is made from matching source glass on a clear background. Bright bits of glass chips dance around the edges of our confetti coasters. Chip colors vary from batch to batch. Each set of four will be made from the same batch source to create a harmonious set of coasters. Blue and white confetti glass is scattered randomly across a black-line base to create a set of four unique coasters in matching glass colors.